The Giant Buddha is located at the confluence of three rivers, near LeShan city in SiChuan province. The film also has scenes from nearby countryside and temples. The Giant Buddha, which is around 70 meters in height, was carved from the cliff face during the Tang dynasty (618 - 907). It took 90 years to complete. At 3,100 meters (10,170 feet), the nearby Mount EMei is the highest of the four sacred Buddhist mountains in China and a UNESCO World Heritage site. This statue was carved into rock during the Tang Dynasty (618 - 907). It is situated in SiChuan province near the town of LeShan. The stone sculpture faces Mount Emei, with a river flowing below the Buddha's feet. 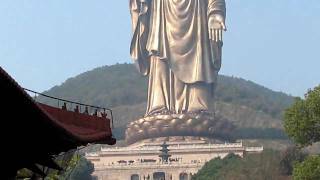 At 71m in height, it is the largest carved stone Buddha in the world. The Mount Emei Scenic Area, including Leshan Giant Buddha Scenic Area, was listed as a UNESCO World Heritage Site in 1996.